Water, Rapeseed Oil (26%), Spirit Vinegar (6%), Modified Maize Starch, Sugar, Salt, Pasteurised Free Range EGG yolk (1.5%), CREAM Powder, Citrus Fibre, Flavourings, Preservative (Potassium Sorbate), Thickeners (Guar Gum, Xanthan Gum), MUSTARD Flour, Lemon Juice Concentrate, Antioxidant (Calcium Disodium EDTA). 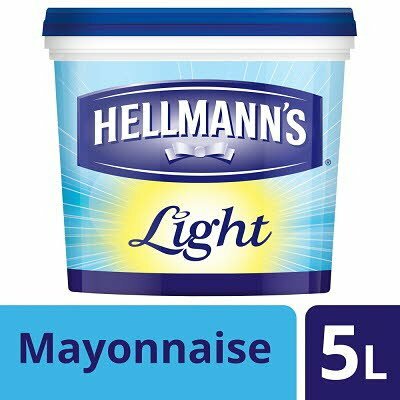 Take your sandwich from good to great with the unmistakeable taste of Hellmann’s! It is perfect as an ingredient, filling, topping, dip or accompaniment to meals including sandwiches and salads. The variations are endless! 8 months from date of manufacture. Refrigerate after opening and use within 3 months. Do not freeze.